a person or thing that transforms something. If this is the definition of 'transformer', then this is like saying that the definition of 'mankind' is equivalent to saying 'white folk'. A little prejudiced against DC transformers, eh? Consider the Perpetual Motion Holder made famous by Edward Leedskalnin consisting of a horseshoe piece of magnetizable iron with at least one coil of wire wrapped around one of its legs. The bottom of each leg is planned smooth and sanded to fit flush against the side of a magnetizable iron plate long enough to span the two legs and create a magnetically closed circuit. A weight is attached to this plate to make it nice and heavy. One end of the coil is connected to a light bulb. The other end of the coil is detached from anything. Another piece of wire comes off the other side of the light bulb and is also not attached to anything. By momentarily connecting the two loose ends of wire to a DC power source, namely: a battery - just for an instant /by brushing the contacts/ while the iron bar spans the two legs of the horseshoe shaped iron core, we now have stored DC energy into this transformer indicated by the bulb momentarily lighting up. We can tug the iron plate all we want to, but unless we slip it sideways, it won't want to come off too readily. And we can leave this device, as is, for any length of time with no diminishment of stored force. 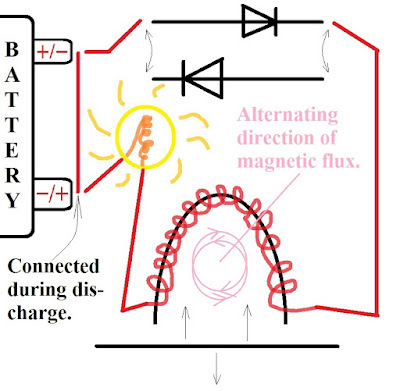 But once we slip the iron plate off to one side and disconnect the magnetic loop, we no longer have any magnetic energy stored inside the horseshoe core. This loss of energy was indicated by the light bulb flashing once again when the magnetic loop is broken upon removal of the iron plate from its fixed position spanning across the two legs of the horseshoe iron core. Now, I contend that this constitutes one half cycle of an AC transformer in which energy is stored and then it is released when the next half cycle is begun in reverse polarity. The storage of magnetic energy constitutes a time delay in which each half cycle of storage constitutes the delay between the moment the energy goes into storage within the confines of the iron horseshoe and plate arrangement, and the moment this same energy comes out. So, the true definition of a transformer is a device which accentuates the factor of delay. This also holds true for electrostatic delay in which the breadth of dielectric spanning two plates of a capacitor governs the rate at which a capacitor may charge or discharge its stored energy. The inside of the chassis was insulated by a thin coating of teflon to prevent arcing. But this insulation also provided for the chassis to function as one plate of a capacitor. And this outer plate was electrically coupled to a lead acid battery pack to harvest the buildup of electrostatic energy (as a useful benefit) to recharge the batteries and hopefully performed in such a way as to avoid blowing up the batteries - which unfortunately happened more often than not! an apparatus for delaying the saturation or desaturation of an electric charge or current across a dielectric or magnetic membrane, respectively, with the intention of altering the relationships between their various causes and effects. This may be what Jim Murray and Paul Babcock have managed to do in some of their devices. 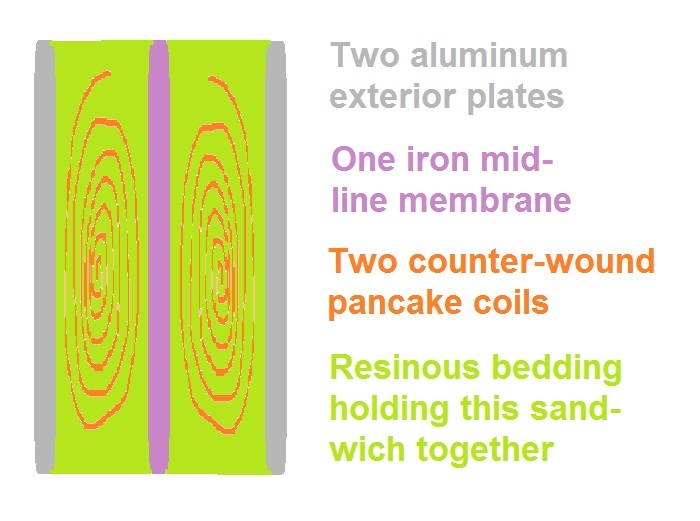 Two pancake coils, counter-wound to each other, are sandwiching a thin (iron?) magnetizable membrane. 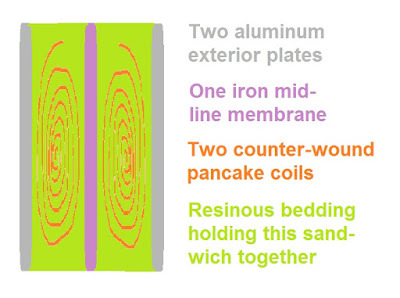 Surrounding this are two more membranes, but this time made of aluminum. All three plates/membranes and coils are thoroughly coated with a resinous sealant, such as: Delrin (aka, Delron) or Tesla's favorite recipe: pine rosin, beeswax and 5% carnauba wax. There is a gap between the three plates and coils sufficient to prevent arcing among them and the coils. The width of the exterior aluminum plates and the width of the midline magnetizable membrane are variably dependent on design characteristics of time delay required for electrostatic and magnetic effects to have any beneficial impact on the operation of the entire system. This device is not a generator in the normal sense, but an extender, in which the load is now contributing to its own power supply /via modification of the load's feedback/ creating magnetic and electrostatic delays. 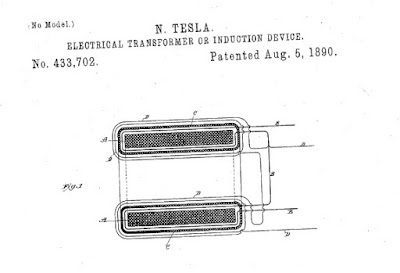 But if William Lyne's quotation of Tesla, and our assessments are [here on this blogsite] correct, this would truly constitute a self-running (not self-starting) generator that could last "5,000 years" with no moving parts.